Celebrity Makeup Artist Ariane Poole’s passion for all things makeup and beauty started at a very early age. After completing a degree in Cosmetology in Canada she worked for a brief time in Vancouver before being headhunted by Biba UK in the late 70’s to be their official makeup artist. Upon arriving in London in Spring ‘79 she discovered that she was one of only a handful of professional makeup artist in the country. “I am honoured to have been one of the pioneers of this fabulous industry”. Ariane’s immensely successful career has spanned over 25 years. A leading name in her field, Ariane works with many of the top fashion & beauty photographers and an impressive list of celebrities (see below). Internationally renowned, Ariane is regularly asked to predict future trends in make-up, as well as give advice and tips on application techniques. 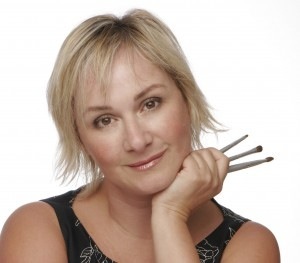 Ariane is a regular contributor to many magazines, newspapers and websites. A regular face on TV, Ariane’s appearances include Style Challenge, GMTV -Lorraine Kelly (beauty presenter for 7 years), This Morning (beauty presenter for 6 years) and the Granada Breeze Make-over Show – ‘Livetime’. Ariane also appeared on Granada’s immensely popular ‘Makeover Hit Squad’ and presented beauty on the Wellbeing Channel. Past credits also include a weekly beauty slot on the Big Breakfast, a 26 part series ‘Let’s Get Beautiful’ for Carlton Digital and the Special K Lifestyle series for Sky. After 4 very successful years as Boots No7’s International spokesperson Ariane launched her own cosmetic range “ariane poole* London Cosmetics” in December 2002.